It’s difficult to overstate the significance of Adobe’s announcement that all of their products will be solely available through Creative Cloud. No longer can you buy packaged version of Photoshop, for example, that are yours forever. Instead you can subscribe to different individual apps or suites. What makes this so interesting is that while companies come out with new products all of the time – this is the 20th version of Photoshop! – very rarely do they come out with new business models. However, there are a couple of bigger picture factors at play as well. As I noted yesterday, the jobs we hire a PC to do are being increasingly done by dedicated devices. If Adobe wants to be relevant in a world where users interact with as many as five different devices in a day, then a per-device licensing model is clearly unsustainable. Even so, their aggressiveness – there will be no more packaged software, period – seems surprising, but the truth is Adobe is probably thrilled with their new model. 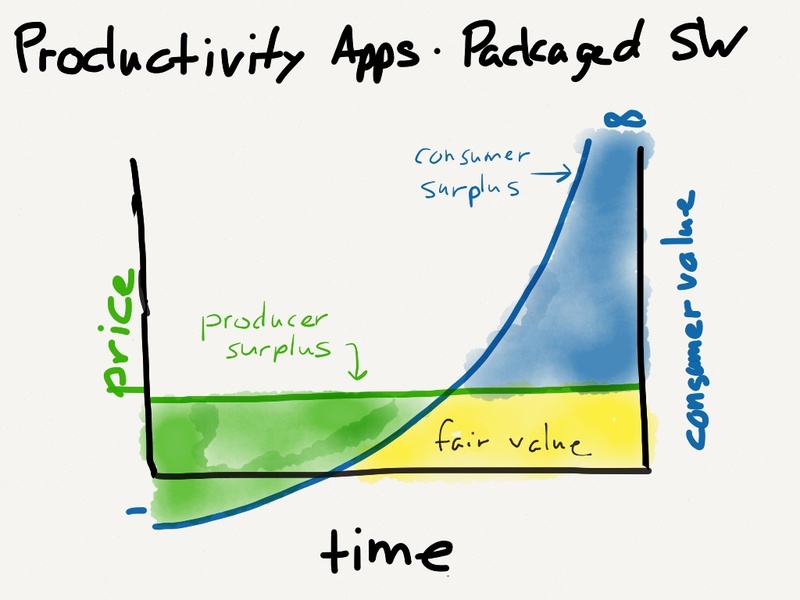 Productivity apps have never been a good fit for the packaged software model. Economic surplus refers to two related quantities. Consumer surplus is the monetary gain obtained by consumers because they are able to purchase a product for a price that is less than the highest price that they would be willing to pay. Producer surplus is the amount that producers benefit by selling at a market price that is higher than the least that they would be willing to sell for. Consumer A rarely edits photos, which means a photo-editing app is worth maybe $20 to him. Yet, he buys Photoshop anyways for $499. In this case, Adobe is, in effect, charging $479 too much.1 The consumer is getting a bad deal. Consumer B is a graphic designer. She uses Photoshop every day, for hours a day. Without Photoshop, she couldn’t do her job, for which she is paid $60,000 a year. In this case, there is a consumer surplus of $59,501. Adobe is getting a bad deal. Consumer C is a student. He has aspirations for being a photographer, but is just getting started. He buys Photoshop, but finds it very hard to use; in fact, he is losing time trying to figure it out. Yet, over time, he becomes proficient, and eventually an expert. The economic surplus shifted from producer to consumer, even though there was no transaction. How do you price a product to best monetize these three very different consumers? If you price too high, you may never acquire Consumer A or C (And Consumer C is a big loss). If you price too low, you are effectively subsidizing your consumers, which may make them feel warm and fuzzy, but not your shareholders. Moving to a subscription vastly improves this model, for both users and Adobe. 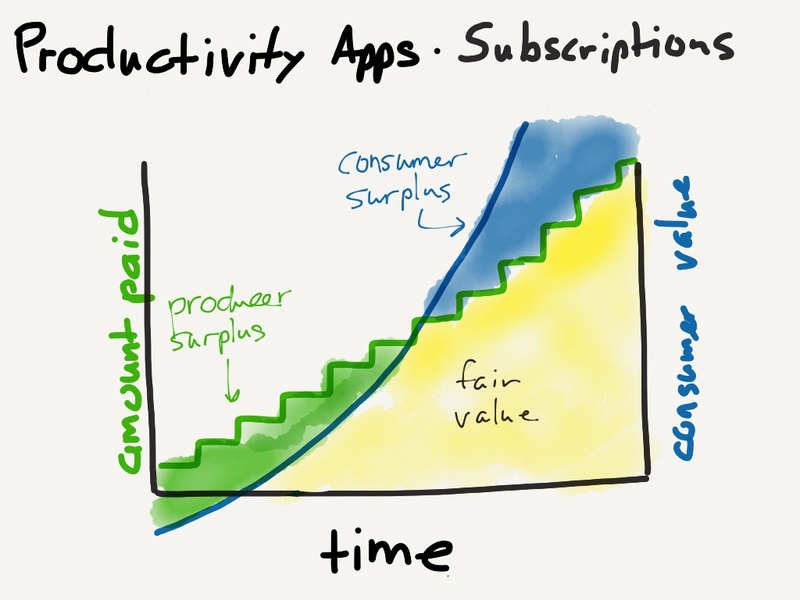 The subscription model more closely matches revenue with value, meaning less surplus. Consumer B will get a great deal right off the bat, but as she uses Photoshop throughout her career, Adobe will be along for the ride, making revenue every month as opposed to every few years. Consumer C is similar to A: Photoshop will be much more approachable, and there will be a lot more Customer Cs. As they become real users, Adobe moves with them. The challenges facing Adobe are shared by almost all productivity apps. Unfortunately, app store economics don’t really work here. If you can’t monetize over time, your users are extracting MUCH more value than you are receiving in revenue. That’s great if you’re a user, up until the company you love sells out because they can’t make money. Sparrow is the canonical example here. How many Sparrow devotees would gladly pay $5 a month to have the app available and continually updated? Trials do ameliorate the pain a little, particularly if you pursue the high price option, but they don’t address the time mismatch: as a productivity app becomes more valuable, the developer doesn’t get a dime of more revenue. For the most part, I tend to turn a deaf ear to developer griping about App Store policies. The purpose of iOS, Android, Windows Phone, etc. is not to make developers’ lives easy; it’s to attract users for the purpose of making money for Apple, Google,5 and Microsoft, respectively. Adopting developer-friendly policies only makes sense to the extent it will attract more users, and most of what developers want doesn’t qualify. What makes monetizing productivity apps so tricky is that they are indispensable to some consumers, yet overwhelming to others. It’s that indispensable part, though, that should matter to platform owners. If a user comes to depend on certain productivity apps that are only available on one platform – and, in general, mobile productivity apps are much more likely to be monogamous – then that user is effectively bound to the platform, and won’t even consider another platform when it comes time to upgrade. The opportunity for growth in smartphones is increasingly previous-smartphone owners (as opposed to new smartphone owners). Keeping those owners around should be a top priority for every platform, and one of the best ways to do so is fully supporting a subscription model for productivity apps. It will make them more successful and thus stickier, ultimately to the platform’s long-term benefit.